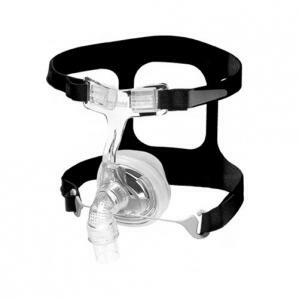 The HC407 offers further advances to the Fisher & Paykel line of CPAP masks. It features the same "Fit and Forget" technology that combines a unique foam cushion shape and headgear design for a comfortable, stable fit. The major differences between the HC405 and the HC407 are the new diffuser design and the new Stretchgear headgear. FlexiFit™ Cushion. The unique inner foam cushion provides a secure seal. One standard size has been redesigned to mold to a variety of nose and bridge shapes. Frosted Silicone Seal. A frosted texture helps the outer silicone cushion seal against the skin. Bias Diffuser. The HC407 exhalation vent has been redesigned from one opening with a filter, to a series of several small holes that reduce noise and soften the release of the air. Filters are no longer needed. Stretchgear Headgear. This new headgear design has an elastic section in the back that keeps the mask seal stable when moving the head up and down, as when moving from sleeping on the back to the side.